The LANCOM Content Filter ensures that network bandwidth is completely reserved for business operations, while websites with spyware, phishing, viruses, etc., are securely blocked. The Content Filter uses a database-driven web-filter technology, with an external evaluation server that checks the requested sites online and rates the actual content. The administrator is free to configure which thematic categories are blocked and which are accessible. Three default security profiles—basic, company, protection of minors—make it quick and easy for you to introduce this solution. Using the LANCOM Content Filter, the permission to access websites from within a network can be freely configured according to the time and personal data. For example, content that is blocked during core business hours can be free to access during the lunch break. It is also possible to create profiles for individual users so that, for example, Internet content that is relevant to their work is unlocked for the persons concerned. 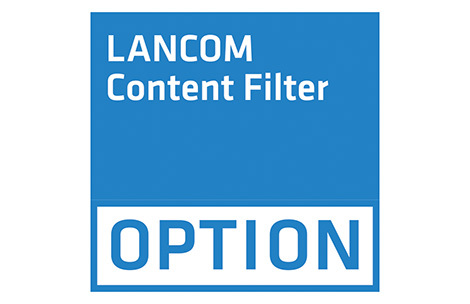 The LANCOM Content Filter provides an extensive range of statistics. For example, you can create top-10 lists for any period of time to indicate the access statistics for allowed sites, blocked sites, and override URLs. Ratings can be carried out according to categories. Statistics are not related to individual persons, which is important for the adherence to strict privacy guidelines. The override button permits temporary access to blocked websites. This enables access to blocked URLs for a limited period of time without having to make changes to the configuration. Overrides can be activated for each category and are optionally logged by e-mail, SYSLOG and SNMP. This is a useful feature when users have justifiable reasons to want or need to access certain websites. The Content Filter is licensed by the number of users. The LANCOM device determines the number of users by counting the IP addresses that receive filtered content. By licensing according to size you can adjust precisely to your actual network and, if necessary, you can conveniently handle a growth in demand.